I started sailing when I was about 10 years old, I had saved all my pocket money to buy a little sailing dinghy. I went to different sailing clubs and schools and became a sailing instructor when I got older. At some point I went sailing almost every day after school and the weekends too off course. I did some local racing in my Laser radial, but sold it at some point so I could buy a ticket to Svalbard and sail back along the Norwegian coast to the Netherlands. After high school I took a gap year to work as a deckhand on a traditional Dutch flat bottom ship sailing with 30 passengers around Holland in the summer and sailing a classic wooden yacht in the winter. As I loved boats and sailing so much I decided to study Naval Architecture and did internships at offices designing (sailing) superyachts. However an office job did not satisfy my sailing and traveling addiction enough, so now I am working as a quartermaster on board a full rigged ship, Stad Amsterdam, 6 months a year. The other half of the year I am either working as an officer on a sailing expedition vessel, going to colder areas like Antarctica or Svalbard, or I am just traveling. My last travels brought me to New York to meet up with Lau, another Sapling. He is a good friend from the Stad Amsterdam and we decided to go skiing in Vermont. We took a trip there with friends from New York and they told us about Oakcliff. Lau got really excited right away so he went there to have a look, and it looked like a really cool place. Going out to sail a lot and learning how to race different kind of boats sounded pretty nice. Also to learn about the maintenance and doing a lot of exercise. So a couple of days later I went to see for myself and it does look really cool. 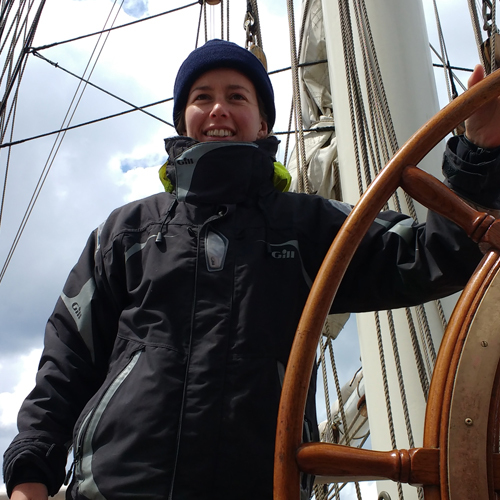 Unfortunately I already had an appointment on the Anne Margaretha to sail to Svalbard, so I can only join the program in July. But I am very much looking forward to it!